Lovely warm weather usually means we eat more salads with our meals and if you are a fan of fresh salads, it’s very easy to grow your own. Lettuce and all the many different mixes of salad leaves grow very well in shallow pots or bowls of compost and by planting little and often from now onwards, you’ll be able to enjoy your own freshly picked salad leaves when you want them. Seed germinates quickly and as the weather warms up the plants grow quickly. The easiest method is to simply sow the seeds thinly in bowls of compost and keep them watered in a light, frost-free place. Alternatively, you can buy young lettuce plants in cell trays to plant into the containers, or you can grow your own by sowing seed into plug trays to produce your own plants for the containers. Although seedlings need a little protection at this time of the year, once we get into May, the seeds will germinate without any protection. The secret of making sure you have a continuous supply of lettuce and salad leaves through the summer is to have several pots at various stages of growth. 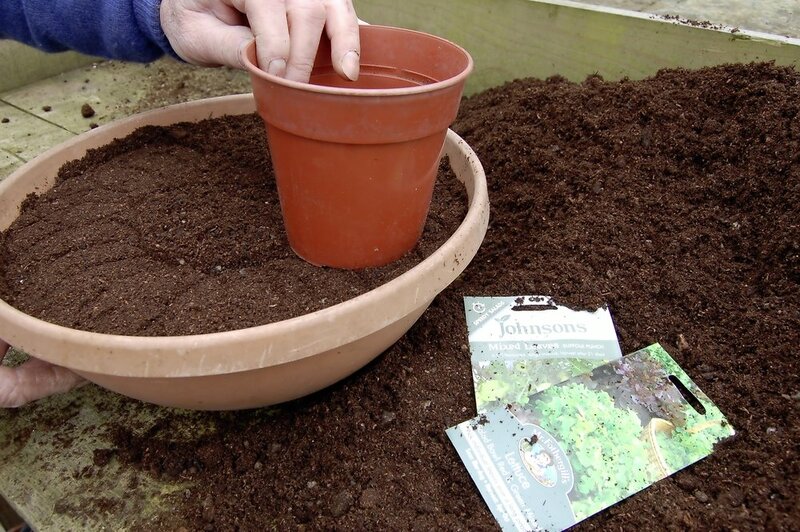 Sow every two or three weeks and as you finish a pot, empty it onto the compost heap, ref-fill with fresh compost and sow more seeds. Fill the shallow pot or bowl with multipurpose compost and use a plant pot to lightly firm the surface to create an even surface to sow on. Sow the lettuce or salad leaves seed evenly over the surface and then cover with a thin layer of compost before watering.